Simple transitions are the simplest way to sequence two motions. During a simple transition between two motions, Golaem will automatically blend the two motions together during a given duration so that the animation is continuous, even if the motions do not perfectly match. Of course these transitions could be designed manually by animators, but this is time consuming and would only allow transitions at some given points in time which makes creating diversity in behaviors complicated. 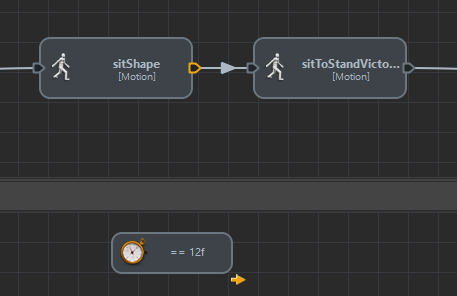 Being able to automatically compute a transition from one motion to another at any time is what enable to start motions with random offsets, or trigger them at any time. Although simple transitions seems like magic, they will not create motions for you. If you need to create a transition from a sit character to a standing one, providing only a sit and a stand motion will lead to a poor result. However they will enable you to easily transition from your sit motion to a stand-up motion with bothering about when you do this transition. See the example below. Note: in this example we will use Motion Behavior, but it works the same way with Locomotion Behaviors or SyncMotion Behaviors. Golaem will blend these animations together at any point in time, based for example on an external event (goal!!! or mexican wave) or like in our example at a given frame. NB: for the blend to happen correctly and the root of your character effectively moving up, all conditions for a correct ground adaptation must be met. As you can see from the above cases, a Motion / Locomotion / Sync Behavior is still active during the stopping duration after the stop trigger is activated. It means that if you want to play a motion exactly once, setting a Motion Time Trigger to 100% and keeping the default stopping duration (0.4s) will not work. It will actually play the motion 100% + 0.4s. If the Behavior is not set to loop, the last posture will be played for 0.4s. However if the Behavior is set to loop, it will loop back to the beginning of your motion and play it for 0.4s. It could cause a discontinuity in your animation if the motion has not been created to loop. disabling Loop on the Behavior. The last posture will still be played, but depending on your use case it may not be a problem.